Emmy marriage proposal: Should you propose in public? Public marriage proposals: Grand romantic gesture or pure spectacle? Should you propose in public? A man's very public proposal at the Emmy Awards was a moment of happiness, but it's not for everyone. With hundreds of people in the audience for the Emmy Awards and millions more watching on TV Monday night, it was the most public of public marriage proposals when one of the winners suddenly popped the question during his acceptance speech. 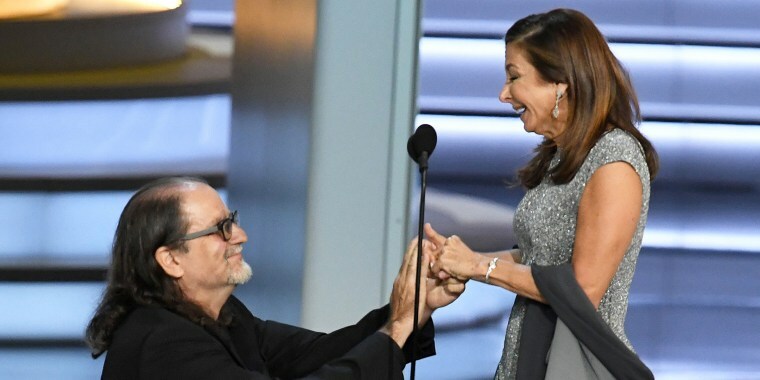 The stars gasped as Glenn Weiss, 57, who received the award for best director for a variety special, addressed his girlfriend, Jan Svendsen from the stage. "Jan, you are the sunshine in my life,” Weiss said. “You wonder why I don't like to call you my girlfriend? Because I want to call you my wife." Svendsen then joined him on stage where Weiss proposed on bended knee. She said “yes” to huge applause and a standing ovation. Many viewers were moved, too, posting kudos on social media. It was a sweet, touching and viral moment of happiness, but public proposals can be controversial. While some consider them grand romantic gestures; others believe they turn what should be a lovely private occasion into a public spectacle in front of strangers. Articles titled “Public marriage proposals must die” and “Proposing in public is the worst and you should never do it” argue a public proposal can put the person being asked on the spot or feel pressured into saying “yes” to avoid looking heartless. Some even suspect sinister, manipulative motives: Perhaps the person asking in such an over-the-top way is overcompensating for something lacking in the relationship or is seeking to turn the attention on himself. Then, there's the risk of getting a very high-profile and awkward "no:" Proposals that were rejected were more likely to take place in public in front of many strangers, a researcher at the University of Manitoba found. Public sentiment also seems to favor an intimate moment. Most women consider "proposing in public" and "proposing in front of friends or family" as the biggest blunders a man could make, according to a survey of more than 19,000 couples conducted by The Knot. Another survey of 3,000 U.S. adults conducted by VeraQuest found 84 percent would prefer a private proposal with just their partner rather than a public proposal. But people who were asked in public were more likely to consider their proposals romantic than those who were asked in private, the poll found. If you’re interested in proposing in public, what should you do? It’s a “super personal” decision based on the couple, said dating coach Bela Gandhi, founder and president of the Smart Dating Academy. First, you “better be damn sure” your partner wants to marry you before you ask in public, she noted. Also, it all depends on your partner’s personality. “Make sure you think that your partner is OK with public attention. If this person is very introverted, very private, doesn’t like attention, it’s probably not a good idea,” Gandhi told TODAY. On the other hand, it could be a very memorable event for both of you that you’ll always treasure and can tell your kids about, Gandhi said. Her own engagement took place in public. Gandhi, who is a huge French impressionist art fan, has a favorite piece painted by Renoir. When he wanted to propose, her husband found the painting at the Art Institute of Chicago and got down on one knee in front of it as a crowd of people formed around the couple. Gandhi had no clue it was going to happen. “It was amazing, it was beautiful, it was organic and spontaneous and I will never forget it and I wouldn’t change a thing,” she said. But Gandhi knows it’s not for everyone. Some people may say “yes” in public, but then consider their decision a disaster later, she said. Gandhi advised people who are being asked in front of an audience to be honest and not get distracted by everyone looking on. “Don’t ever get pressured into marrying somebody because you get caught up in the whole bridezilla industry. If this is not the right person, say no. It’s OK,” she said. Fortunately for Weiss, the man who proposed at the Emmys, everything worked out just right. “The timing just lined up very nicely, and it was a really magical moment,” he told People.